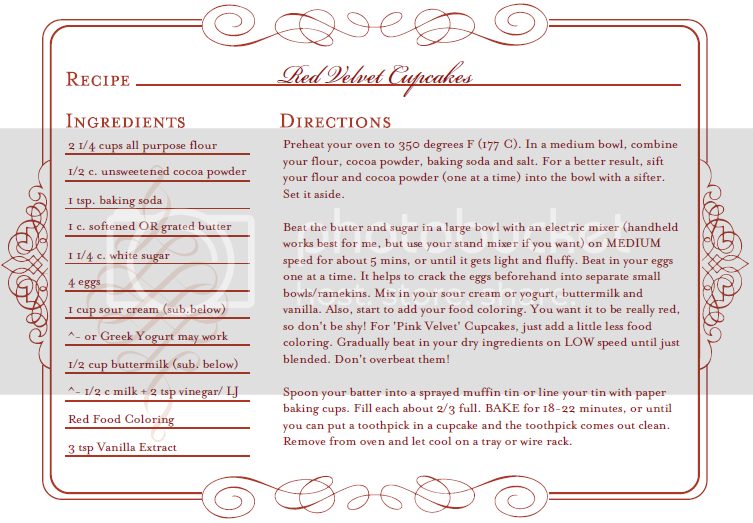 New Profile Colors and Red Velvet Cupcake Recipe! kay soooooooooo...I haven't done this in a while. Sorry guys! so I changed it and I like it now yaaay! I'm finding myself to be getting better at color schemes, which I guess i'm kind of proud of? I mean, who doesn't want to be a colorschemer. but hey... feel free to go see the real thing. so here it is, my new profile! I quite like it. Tell me if you like it (or do not) too! so now for my red velvet cupcake recipe! I've adapted it to my taste from a couple of other websites, so I guess it's not technically 'mine'. For those who don't know what red velvet cupcakes are, they're a type of chocolate cupcake that are a little tangy. You frost them with cream cheese frosting or vanilla buttercream, usually. 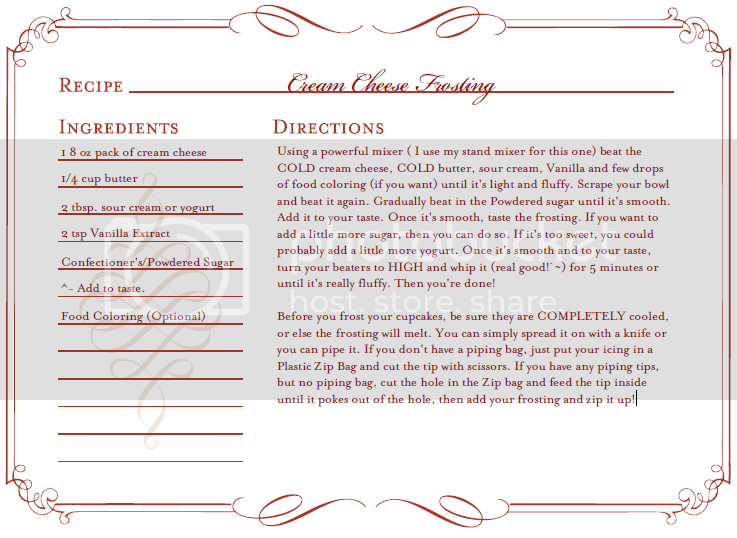 I have provided a recipe for the cream cheese frosting. For a creative twist, you could use blue food coloring or any other color! Red/Pink are just the traditional way. It seems a little unorthodox for a Portuguese girl to be making these American cupcakes...but I will. anyway, these are really yummy and I hope you enjoy them! Definitely tell me how they turn out if you make them! Grated butter may sound weird, but it works! If you do not have enough time to soften the butter completely, grate it with the large holes on a box grater (cheese grater)! Let it sit out for about 5-15 minutes while you collect ingredients/equipment and do your dry mix before you grate it. (sub below) means I have provided a substitution for the ingredient, if you don't have the original. LJ is lemon juice, and I always use bottled. Use Lemon juice OR white vinegar. not both. For the buttermilk substitution (if you don't have buttermilk), let the milk and vinegar OR lemon juice sit for about 5 minutes before using it. Be sure to stir the LJ or Vinegar in the milk haha. For the sour cream substitute, you can use any type of plain yogurt. Whole milk yogurt would probably work best. I wrote down greek yogurt because it's a little healthier. Just be sure your yogurt is plain! I love your colors, actually. <3 and yumm, those look delicious! Location lost in the world.